Grist Mill Road by Christopher J. Yates. Picador USA, 2018. Hardcover. 352 pages. I read Christopher J. Yates' Black Chalk a couple of years back and really enjoyed it, so I was extremely excited to have a chance to read an ARC of his latest novel, Grist Mill Road. I fully expected another dark, twisty novel that would keep me turning the pages, and Yates masterfully delivered on just that. 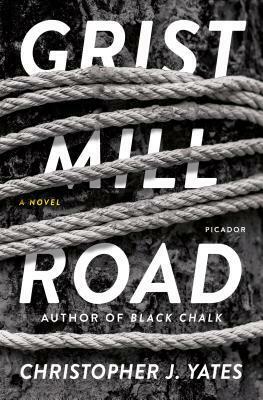 Grist Mill Road was hard to put down. This book felt like a very unique novel, as well as one that is difficult to describe. The synopsis itself sounds like a fairly regular thriller, but the way in which Yates tells the story is what sets it apart. It's very dark and unafraid, but there is a beauty to the writing style that makes it a rather mesmerizing tale. This is also one of those thrillers where the less that is said about the story itself, the better, so this might be a bit of a shorter review. This book has a fairly simple premise--three friends living twenty-six years after a terrible crime they committed--but it goes so much deeper than that, and there are so many layers to each and every aspect of this story. And if you're at all into potentially unreliable narrators, then this one will be sure to please you. I was also both surprised and impressed by how emotional and raw this book felt in regards to harsh subject matters, such as abuse, and psychological issues; Yates delved deep into these areas and I think pulled it off in an extremely effective manner. In much the same way as he did in Black Chalk, Yates once again introduced us to a small variety of extremely complex and unpredictable characters. Each character has such a deep, complex background that seeps into the actions of their present lives almost daily. The story is told from the perspectives of the three friends involved, alternating with both past and present narratives, which really helped build up tension and suspense as the story progressed. His characters also comes across as being very much on the morally grey scale. On that one hand, you want to feel pity for certain reasons, but on the other hand, they're not exactly innocent, either. But I almost think that that's part of the overarching theme of this story--none of us are innocent, so where and how can justice and understanding occur? This book unfolds slowly, though the book itself is not a slow reading experience. We are given only a small bit of information at a time that makes it hard not to keep reading to discover just how or why something happened or what a particular character's motivation for doing something is. Just when you think you know or understand something, another layer is revealed and the entire image of the situation is changed. Quick note that this book deals with quite a few heavy topics, so if you're not sure if you want that or have any issues, then just proceed with caution. Overall, I've given Grist Mill Road four stars. This book was a solid, immersive read that is sure to draw you in.